TieDyeGlass.com brings you handmade, functional, Tie Dye Glass™ home decor products from the Portland, Oregon studio of glass artist "Stanman". Stanman enjoys creating functional art glass in fantastic colors and patterns rarely seen in the art glass marketplace. The Tie Dye Glass™ products Stanman creates are made from hand cast sheets of colored, art glass purchased locally at the Bullseye Glass factory in Portland. 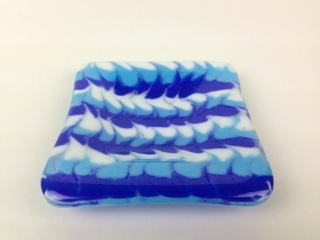 The glass is cut to shape, then designed & fired in one of his kilns to produce his unique products. Stanman fires the glass several times over several days at temperatures ranging between 1200-1500 degrees. No dyes, paints, or decals were used in the making of his Tie Dye Glass™ products...its all glass! Stanman's Tie Dye Glass™ products are available on Amazon.com where you can get FREE 2-Day Shipping by ordering with your Amazon Prime Account. Click here for our Etsy.com store which has a wider selection of our products for you to choose from. For more information please call 503-431-1763 or send an email to: "Stan@TieDyeGlass.com". Learn About Stanman's Creative Process For Creating His Tie Dye Glass! 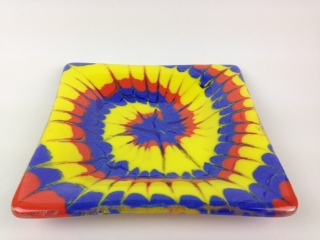 Checkout Stanman's Art Glass Plates Made From "Tie Dye Glass"! 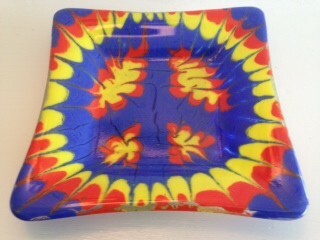 Checkout Stanman's Small Glass Trays Made WIth "Tie Dye Glass". 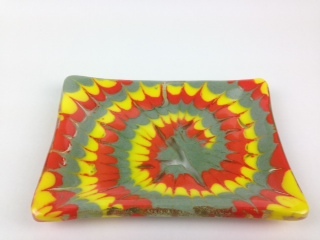 Checkout Stanman's "Tie Dye Glass" Soap Dishes! 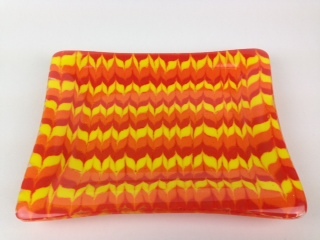 Stanman Creates Groovy Art Glass Plates, Trays, Tiles, and Soap Dishes! Stanman enjoys creating functional art glass from his Portland, Oregon studio in fantastic color combinations and patterns rarely seen in the glass art marketplace. Contact us for more information, or help with your recent order.